Huffington Post blogger’s case for banning hand-held devices for children: missing scientific proof. A Huffington Post blogger’s shaky case for banning hand-held devices for children. Research suggests it’s the type of media that children consume during screen time, and not the screen time itself, that really matters. In a recent Huffington Post piece that has now been shared on Facebook more than 345,000 times, pediatric occupational therapist Cris Rowan cites “10 Reasons Why Handheld Devices Should Be Banned for Children Under the Age of 12.” She uses studies to back up her stance, but there’s a problem: The research she highlights, and her characterizations of the findings, make the issue seem far more clear-cut than it really is. Under the guise of “science,” Rowan makes vast generalizations and extrapolations that are anything but scientific. Here’s an example. One of the first points Rowan makes is that overexposure to technology in kids has been associated with a slew of negative developmental and behavioral outcomes. She references a 2004 study that links television exposure at ages 1 and 3 to attention problems at age 7. I’m not sure why she is discussing television at all, considering that the ban she proposes is on hand-held devices and not TV, but nevertheless, when Danish researchers tried to reproduce these findings later that year, they did not find any association between television viewing and subsequent attention problems. In fact, what they found was that “children in our study, who were watching > 1 ½ hours of television at the age of 3 ½ years, were more likely to have ADHD-like behavior already at this age” (emphasis mine). In other words, perhaps attention problems can lead to TV-watching, not the other way around. This example illustrates that these kinds of association studies—the ones that report that kids who do X are more likely to do/have Y, which Rowan cites throughout her post—do not tell us what causes what. It may well be true that kids who play tons of video games are more likely to be obese, as Rowan also writes, but to imply that we know that the video games directly cause obesity is unfair, as kids who play too many video games may do other things conducive to weight gain. Maybe their parents don’t get them out of the house enough. Maybe they tend to eat a lot of junk food. It’s also not crazy to think that kids who become obese are then more likely to start playing video games. Observational studies try to control for these types of “confounding” factors, as they’re called, but sometimes it’s impossible to know that the controls have been adequate. In fact, some research suggests that when researchers do carefully control for factors like IQ and socio-economic status, the seemingly negative effects of media exposure can disappear. (Further complicating the picture, as Darshak Sanghavi pointed out in a 2012 Slate article, is that some “passive” video games burn as many calories as light exercise.) These same issues of causality pertain to the associations Rowan cites between media use and childhood sleep deprivation: Perhaps, as one recent study suggests, some kids play video games because they can’t sleep, not the other way around. 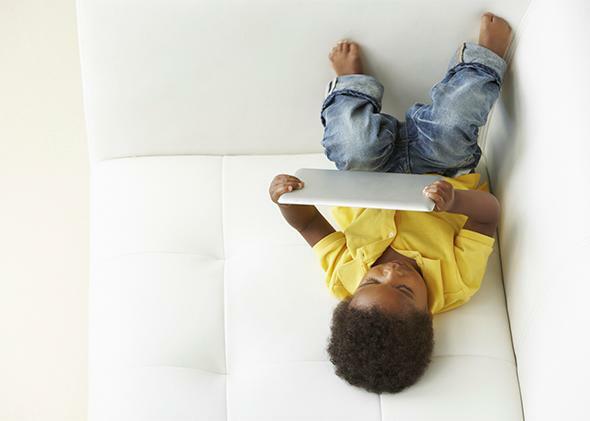 Am I saying that there’s no reason to limit screen time in kids? Absolutely not. There’s little doubt that, on average, American kids spend too much time plugged in, and that excessive media use can be detrimental. But research hardly suggests that we should “ban” all hand-held screen use in kids, as Rowan suggests in a piece hundreds of thousands of readers have shared. You let your children listen to Green Eggs and Ham on the iPad every once in a while or watch Sesame Street on a rainy Saturday morning? Do not be ashamed.